Anybody know how to find the pic that was posted here years ago that showed Kevin Faulk photoshopped into a red jersey with silver pants and the current helmets? I don't have it saved, but I thought it looked very sharp and it didn't even make me think of Ohio State. And it would be easy to do without messing with the helmets. It’d go with any color uni on the planet. 13-3, 1st seed in the playoffs while the other 4 teams above are home watching the games. Extraordinary job done by Belichick and his staff this year yet BB won't sniff Coach of the Year. 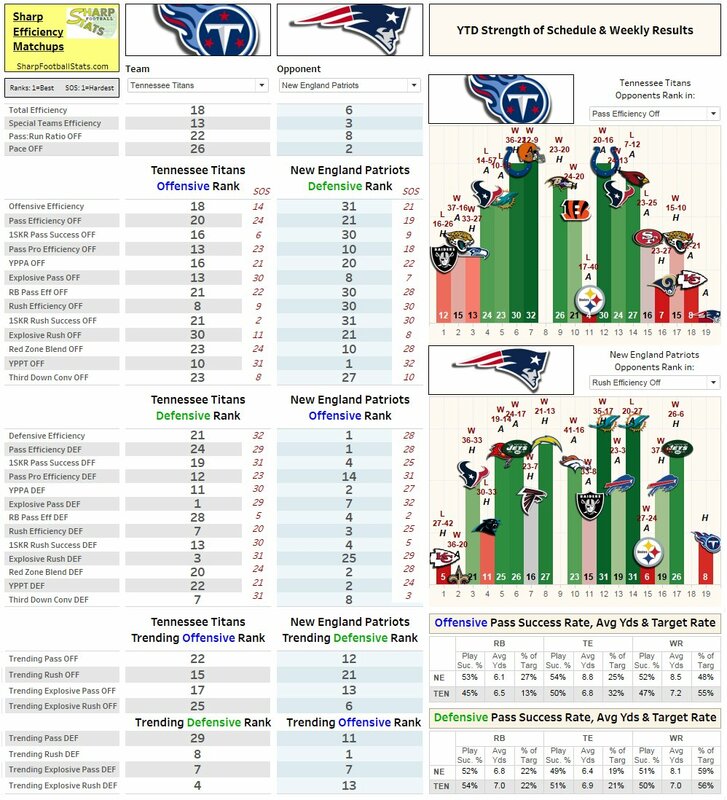 A strength of schedule infused, advanced stats matchup card for the Titans at Patriots, via http://www.SharpFootballStats.com . Even more remarkable, the closest contemporaries were dumpster fires and only Wash was still within sight of the playoffs by week 10. I miss the packages I used to get from Dan Pires. so much good info in those things. How about a new helmet design next year? I love silver personally...maybe destress the silver a little. Make it look like its been gouged, weathered, peeled, etc. Then it would be even better. Dan Pires has a nice package? I don't exactly remember him mentioning the "soccer jerseys" . I just remember him specifically griping about the stripes on the pants in a presser and it sounded like he thought they were not the image he wanted the Pats to project. Like we looked like pussies because of the pants. Anyhow, based on the photo below, we did have the "striped" jersey with the big FE for at least one season after we changed the pants. I would love to see Pat Patriot make an appearance in the SB. Nothing would be better than seeing them win one if the old school gear. The red color is ok, but, that design sucked. If you could take a look then I'd appreciate it, but don't go nuts looking for it. That uni came up in a conversation about the old unis I was having with a guy at the next tailgate over last week and he couldn't imagine it the way I described. I should've saved that thing somewhere. The guy that did it was a very talented digital artist as I recall. I realize uniforms is a trivial thing, but I always imagined how cool it would be if the Pats came out of the tunnel wearing those threads and surprised everybody. I think the place would go nuts. Tradition is great, but I think it's also fine to mix things up once in a while. Well, I found it. And saved it. Couldn't find it on my personal or work computers. I scoured the servers at patriotsplanet.com and patriotsplanet.net cause I save some images there too. Nada. Couldn't find it on a Google Image search. On the FIFTH page of my search results, I found it on a BING image search....posted on Tumblr, and re-posted on Reddit. Anyway, I have a local copy now. There were others at the time too that I could not find. The only one I remember was Dillon. That is a GREAT looking uni! Five playoff teams and Aaron Rodgers? Not sure I'd classify that as "nothing". Luckily we get what I consider the three tougher tests at home; the Steelers, we know the Pats can beat them in Ketchup Field. It's basically the current jersey with the red color and a silver stripe. The font for the numbers look the same. I'm surprised that Bobby never used this as an alt jersey...or something similar. the Patriots of New England fought and defeated the Red Coats, the Change to the blue Uniform also coincided with the change in the organization. It is almost like we were held back by the red jerseys, like the original Patriots were held back by the red coats. The Blue revolution set us free.